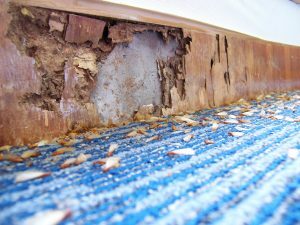 If termites are found, you don’t necessarily have to bail on the home all together. It should be requested that the home seller rectifies the problem by having the property treated by a professional. A home seller will most likely have it fixed or negotiate a different selling price. This is specifically something that you can talk with your buyer agent about. If termites have damaged any structural beams or posts, the costs could rise even higher as a licensed carpenter would then need to be contacted for such repairs. As a home seller, there are many things you can do to prepare your home for sale and it’s strongly recommended that you do your homework. You don’t want a potential home buyer finding out that your home may have a termite problem. It could be the difference between getting a sale and not getting a sale. If you notice any evidence of termite activity, get an inspection. You can shop around and look for different deals to save the most money as well. If you happen to miss termite damage and a buyer finds it, it’s usually recommended have the home treated. If you don’t and the buyer walks then you have to disclose the information to the next potential buyer and it’s not an attractive situation in which someone wants to walk into. There are a few easy ways to detect the presence of termites in or around your property. Investigate the side of your foundation or support beams for “mud tunnels”. These will look like lines of dried mud. Termites create these tunnels to move around and form colonies. There may be a pile of discarded wings near the windowsills of your home. Termites shed their wings in the spring. Termites eat wood from the inside out so you usually won’t be able to see the damage from the outside. Tap the wood and listen for a hollow sound as that’s often a strong sign of termite damage. A final thing that you can look for are termite dropping which look like sawdust piles. The droppings may be near any wood infested with termites. Whether you have had termite issues during your real estate process or not, it’s important to stay on top of the issue in order to prevent them in the future. The two things that termites love are wood and moisture. Any wet or decaying wood in your home should be removed. To help keep water away and out of your home be sure that gutters and downspouts are cleaned out and pushing water away from your home. Even wood that attracts termites outside of your home can be a problem. Remove any tree stumps or wood being used for renovation projects, and when piling fire wood, place it so it’s not touching the house. Finally, be sure that mulch is sloped away from the house. For more information about buying or selling a home and how termites affect it, please feel free to reach out. The real estate process is a difficult one and understanding how to handle each situation is crucial to save you the most time and money.